According to Meridian Mayor John Robert Smith, “Meridian was born of the railroads. But it was the great, cultured Jewish mercantile families, mostly immigrants from Germany, who raised it up and breathed life into it.” Jews were actively involved in the creation and development of Meridian. Recorded Jewish life in Lauderdale County began in the town of Marion, located just six miles from the center of present-day Meridian. County records show that David Rosenbaum purchased land in the town in 1837. The families of Abraham Threefoot, Isaac Rosenbaum, Leopold Rosenbaum, E. Lowenstein, and Jacob Cohen reportedly lived in Marion during these early years. After the Civil War wreaked havoc on east Mississippi, Meridian became the hub of Lauderdale County, as many families relocated from Marion to the growing city which had just been named the county seat. By 1869, ten Jewish families lived in Meridian. In the 1870s, Meridian began to flourish with the construction of the railroad through town. Meridian became a crossroads and a regional center of trade and industry. The community of early Jewish immigrants embraced and enhanced their adopted city, making it their own, and bolstering its economy and civic life. Many fine examples of architecture remain in downtown Meridian, attesting to the memory of the bustling railroad era and bearing Jewish names that commemorate the community contribution to Meridian’s grandeur. By the 1880s, Jewish merchants had established themselves in Meridian with many successful stores along Front Street. Israel A. Marks, a German-born immigrant, began his career as a peddler supplying rural families with dry goods. In 1870 he operated a wholesale dry goods business in Meridian and in the 1880s consolidated his business with that of Lichtenstein and Company; the combined operation encompassed nearly an entire block of Front Street. After Lichtenstein’s departure in 1887, Marks began a company with his three half-brothers: Sam, Levi, and Marks Rothenberg. Their operation, Marks, Rothenberg & Company, became one of the largest wholesale grocery and dry goods businesses in the South. In 1899, they opened a mammoth five-story location. All four partners of the Marks, Rothenberg Company were leading citizens in Meridian. Levi Rothenberg was the president of Meridian’s first bank, and Israel Marks served on the board of another local bank. Levi was also an early member of the fire brigade, and served on the water works and insurance commissions. Israel Marks and his brothers also played an instrumental role in establishing Highland Park, donating much of the land for it. Marks served as president of the park commission from its formation until his death in 1914. A statue of Marks still adorns the park. Though remembered for many other civic contributions, the proprietors of Marks, Rothenberg and Company are perhaps best known for building the Grand Opera House next to their downtown store. Completed in 1890, the Opera House attracted performers from all over the United States to the growing railroad and business center of Meridian. After lying dormant for almost 80 years, this gift of the Marks and Rothenberg families to the city of Meridian has recently been restored to its original glory and performers once again grace its majestic stage. The great economic success of Meridian Jews and the influx of Jewish immigrants from Eastern Europe during the late 19th century allowed for two synagogues in the city. Meridian Jews formed Beth Israel in 1868. By 1874, they had joined the Union of American Hebrew Congregations and embraced Reform Judaism. When Jewish immigrants from Eastern Europe began to arrive, they preferred a more traditional style of worship. Rather than joining Beth Israel, they formed their own Orthodox congregation, Ohel Jacob. Members of the Orthodox congregation worked hard to balance their traditional practice and the demands of their new home, and had to make many compromises. In the early 20th century, Ohel Jacob would hold Saturday morning services from 6 am to 8 am so its members could open their stores by 9am. Merchants in Meridian could not refrain from working on Saturday, the busiest day of the week for most stores. The Jewish community took an active part in civic life in Meridian. Rabbi Judah Wechsler, who became Beth Israel’s spiritual leader in 1887, was heavily involved in the issue of African American education. He led the movement to provide public school facilities for blacks during a time of racial segregation. In 1888, he campaigned for a bond issue to construct the first brick public school building for African Americans. When the bond issue passed, Meridian’s black community asked that the new school be named in the rabbi’s honor. The Wechsler School still stands today, and is being restored as community arts center. ​Meridian grew into one of the largest Jewish communities in the state. In 1927, 575 Jews lived in Meridian. Jewish businesses dominated the city’s downtown. These included Levy & Tannebaum Confectionary, Lowenstein & Brothers Grocery, Eagle Cotton Oil Company, Strauss & Lerner Jewelry Store, Metzger & Kahn wholesale and retail grocers, and many others. Louis Davidson founded the St. Louis Junk Company, which grew into the Southern Pipe and Supply Company, which remains a successful family-run business today. Meridian Jews were very integrated into the city, sometimes going into business with non-Jews. Harold Meyer and Hunter Webb founded the Meywebb Hosiery Mills in 1930. Meyer later built the Lamar Hotel, which now serves as a county office building. Another spiritual leader who left a significant mark on Meridian was Paula Ackerman. When her husband, Rabbi William Ackerman, died suddenly in 1950, Meridian’s Beth Israel congregation asked Paula to serve as their spiritual leader until they could find a replacement. For three years, the unordained Paula acted as Beth Israel’s full-time rabbi, leading services and even performing weddings. She was the first contemporary American women to officially serve in a rabbinic function—Paula's pioneering tenure was 20 years before the first woman was ordained in the United States. While Jews had long enjoyed social acceptance in Meridian and rarely faced prejudice, the turmoil of Civil Rights unleashed the anti-Semitism within some segments of the larger community. A group of Ku Klux Klan members from Jackson, who had bombed the temple and rabbi’s house there, bombed the new education building of Meridian’s Congregation Beth Israel in 1968. When they returned later to bomb the home of Meyer Davidson, an outspoken leader of the Jewish community, they were captured by police after a shootout. Leaders of the Meridian and Jackson Jewish communities had raised money to pay a Klan informant, who tipped off the FBI about the attack on Davidson. Like other southern Jews, Meridian’s Jewish community was often ambivalent towards the Civil Rights Movement. When Michael and Rita Schwerner, two Jews from New York, came to Meridian in 1964 to organize a voting rights campaign, they received a cool reception from the Meridian Jewish community, who feared being associated with these “outside agitators.” Several Jews, including Rabbi Milton Schlager, found time to meet with the Schwerners, and expressed their sympathy for the goals of the movement but questioned the young activists’ tactics. Fears of anti-Semitism were not unfounded as evidence suggests that Klan members specifically targeted Michael Schwerner at least partly because he was Jewish. When Schwerner was abducted and murdered along with fellow civil rights workers James Chaney and Andrew Goodman, moderate Jews in Meridian were further scared into silence. Despite these fears, many Meridian Jews worked to change the city’s system of racial discrimination. Several local Jews joined an interfaith group called the Committee of Concern that pushed for the prosecution of people who burned black churches. When Meridian agreed to integrate its schools, Lucille Rosenbaum, a member of the school board received death threats. The Klan also targeted other prominent Meridian Jews who called for integration. Yet over the span of Meridian’s history, these attacks stand out as the exception rather than the rule, as Jews have faced little anti-Semitism in Meridian. I.A. 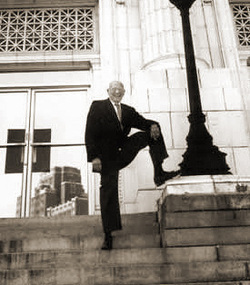 Rosenbaum served eight years as mayor in the 1970s and 1980s, and his Jewishness never became a public issue. Jews have always been an integral part of Meridian’s leadership, and their presence helped to ensure a more moderate response of Meridian to the Civil Rights Movement. Indeed, Klan members waited for Cheney, Goodman, and Schwerner to travel to a different county before they abducted them because they knew Meridian’s city leadership would not tolerate such violence. It’s impossible to separate the story of Meridian’s Jews from the story of the city itself. Jews have been closely involved in Meridian’s development since its founding. The Jewish role in Meridian’s history is etched in the city’s downtown buildings where the names of the great Jewish leaders who helped build the city are still visible. While the Jewish community remains historically significant, it has declined in recent years. Ohel Jacob closed in the early 1990s, and Beth Israel no longer has a full-time rabbi. In the early twenty-first century, fewer than 40 Jews remained in Meridian, most of whom were elderly.